NEW HAVEN — Will the streak ever end? 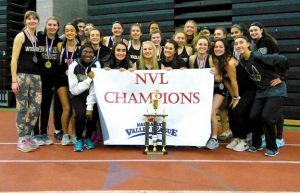 Who knows, but now two full cycles of Woodland High students can say they won Naugatuck Valley League girls indoor track titles every year of their career. 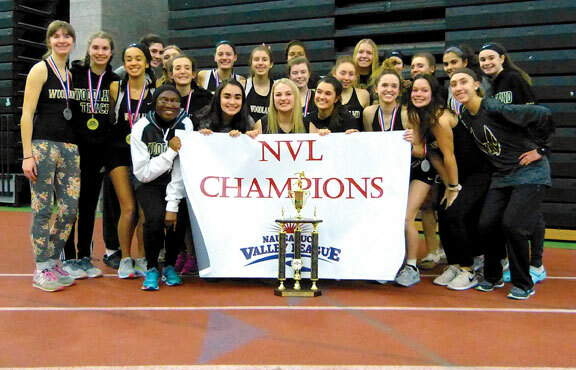 Woodland stretched its unbelievable NVL championship streak to eight on Jan. 28 at the Floyd Little Athletic Center in New Haven. The Hawks earned 99 points to outpace Watertown (84 points) and Seymour (76 points). While the Hawks often win these championships with quality depth and relay victories, this title formula was a little bit different than usual. Woodland won two individual events — Jaden Young in the 1000 meters (3 minutes, 13.84 seconds) and Jasmine Michie in the shot put (36 feet, 2 ½ inches) — and the 4×800 relay, but the Hawks also filled up the standings with plenty of second- and third-place finishes. Those seven athletes had a hand in 91 of the Hawks’ 99 points — 72 of them individually. Young (first in the 1000, fourth in the 3200) and Brennan (second in the 600, third in the 300) led the way with 14 individual points apiece. Slavin (third in both the 1600 and 3200) picked up 12 points, while Michie earned 10 points for her shot put victory. 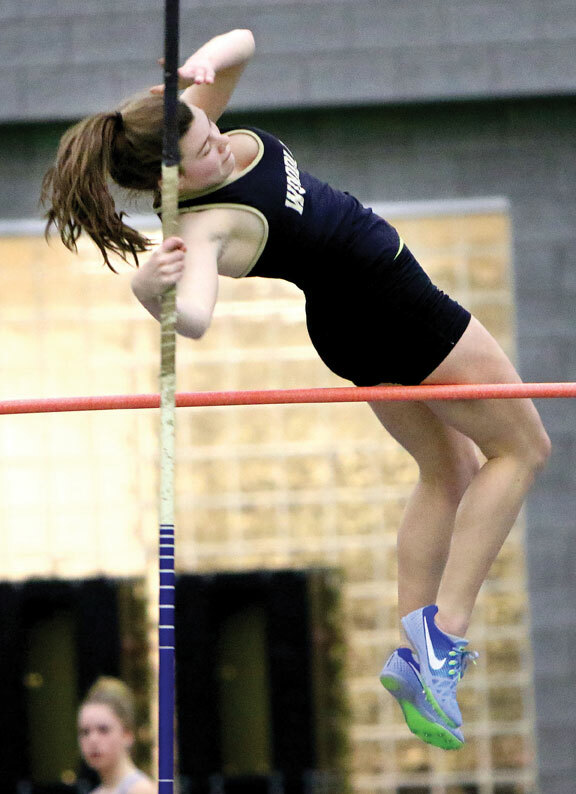 Poynton (second in the long jump) and Bernier (second in the pole vault) each earned eight points, and Poulos (fourth in the 1000, fifth in the 3200) racked up six points. The 4×800 squad of Slavin, Poulos, Young and Jill Brotherton earned 10 points in beating the field by nearly 10 seconds, finishing in 10:40.69. The 4×400 team (Brennan, Kim Poulos, Karly Laliberte and Erica Poehailos) nabbed eight points with a second-place finish in the final event of the meet, and the sprint medley (fourth) and 4×200 (sixth) relays also earned points. The only other individual athlete to earn points on the girls side was Kim Poulos, who gained four points with a fourth-place finish in the 600. The Woodland boys finished ninth in the competition with 24 points, well behind champion Watertown (76 points). The Hawks’ top finish was a second-place showing in the 4×800 relay with Charlie Schwarz, Mike Falcone, George Hughes and Matt Iannone. Other point-getters for the Hawks included Edit Krivca (fourth in the 600), Colin Slavin (fourth in both the 1600 and 3200), Cole Barrows (fifth in the pole vault), and the 4×400 relay team (fifth). After NVLs, the Hawks turned their focus to the Class S state championships Thursday in New Haven. The State Open is set for Feb. 16.